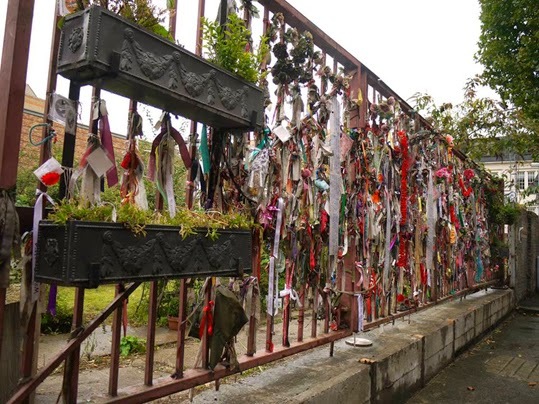 The gates at Crossbones Graveyard - a historic burial ground for prostitutes in Southwark, London - have moved. In their new position the gates now allow a better view of the gardens inside the grounds. This picture of the new-look site was taken by Katy Nicholls. "Transport for London (TfL) has moved THE CROSS BONES GATES a few yards south down Redcross Way. The gates were moved respectfully, without damaging them, and we can now look through them directly into our 'Goose Garden'. "TfL are close to signing a lease for a 'Meanwhile Garden' with Bankside Open Spaces Trust (BOST). This should eventually enable public access for community gardening. TfL have now accepted that the Crossbones site will be protected in the future. This is not the end of the long journey, but it is a momentous step forward."